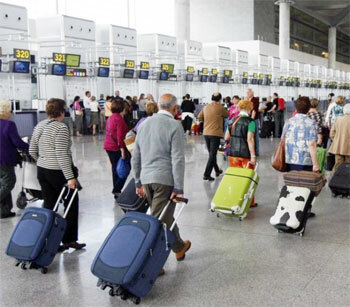 German tourist arrivals at Malaga airport last year grew 3%. As explained yesterday the president of the Costa del Sol Tourist Board, 79.8% of German tourists who had visited the Costa del Sol had done so previously. According to the latest report by the Tourism Board on the German market, is reported the existence of a new German tourist profile. Currently, the tourist destination receives tourists with more purchasing power, who tend to opt for four-star hotels and to extend their stay. Relying on the good behavior of the macroeconomic data for Germany, the Tourist Board predicts that by the end of 2011will be recovered pre-crisis levels. It also takes into account that the German population is one with the highest propensity to travel in the world. 75% of the population traveled in 2010 and this optimism continues in 2011. The high degree of loyalty of German tourism to the Costa del Sol is based, according to the report, in their own experience. However, 40% of German tourists who traveled to the Costa del Sol for the first time had learned about the destination by the recommendation of friends or relatives. If we look at what things value these tourists at the destination, the main features are the hospitality and climate, followed by beaches and the ambience. The average mark awarded by Germans tourists for the Costa del Sol is set at 8.1. Another fact about the German tourist profile is that 60% gets its package tour through a travel agency, be it traditional or virtual. Only 26.4% buy online.